The Dobson Ozone Spectrophotometer has been used to study total ozone since its development in the 1920's. The observations of total ozone, the total amount of ozone in a column from the surface to the edge of the atmosphere, by this instrument is one of the longest geophysical measurements series (at Arosa, Switzerland) in existence. 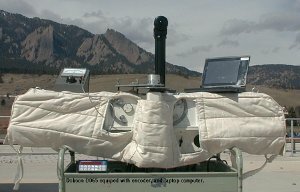 Today, the instrument is an important part of a global effort to understand the role of stratospheric ozone in atmospheric chemistry, biological and ecological effects of solar UV radiation, climate and weather. ESRL/GMD maintains 15 stations which use the Dobson Ozone spectrophotometer, and is the World Dobson Ozone Calibration Centre under the Global Atmosphere Watch, responsible for the calibration of the 100+ instruments worldwide.